Alfonso Sy Jnr. provides another way for Filipinos to enjoy life with a premier loyalty and privilege programme. Life is meant to be enjoyed, as told by Alfonso Sy Jnr., founder of the country’s premier loyalty and privilege programme called, “Enjoy.” Now with over 275 restaurants, hotels, and other lifestyle establishments as brand partners, the programme certainly has achieved a great milestone from an idea that started six years ago during a vacation in Shanghai. “My business partner Glecy Lopez-Go presented me with this red tin can and told me, ‘Hey, I think this is a really cool idea. It’s a booklet that gives you 50 percent and two meals for the price of one promo in nice restaurants,’” Alfonso said. The existing relationship with restaurant owners was an advantageous factor in promulgating the concept of Enjoy China Holdings (HK) Limited, which offers discounted deals in establishments through an annual membership. Enjoy Philippines has also been accepted by Filipinos since the country holds a great number of frugal but passionate gourmands. It shares the pie with other companies vying for these accessible consumers. Enjoy Philippines differentiates its programme by providing a restored Enjoy VIP PH application on iOS and Android smartphones and a kit that includes all the coupons for the year upon acquiring membership. “We’re also the only programme that automatically comes with 25,000 pesos’ worth of instant gifts from our partners so you can get a free dish by simply presenting the coupon,” Alfonso says. 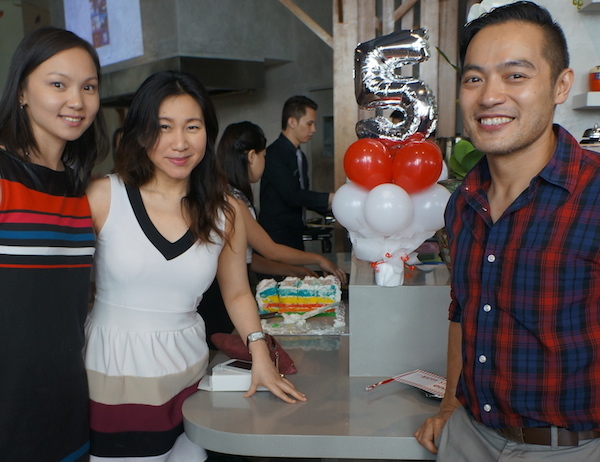 As Enjoy Philippines turns five years old, media and brand partners were invited to a party that embraced one’s inner child with the presence of a birthday cake, balloons, and a cupcake Ferris wheel. Business Development Director Mennie So, Heidi Ng, Founder Alfonso Sy Jnr. “The word ‘enjoy’ captures very much what you want to be experiencing, what it is you want to be feeling when you’re out, so we thought that verb sums up what the whole programme is about,” Alfonso says with a smile. For more information and enquiries call +632.478.8888 or visit www.enjoythebest.com.ph.